2018 has been a major year for developments coming out of the tech world, especially in the fields of Artificial Intelligence, retail and customer behaviour. As a result, the shape of customer experience is about to undergo some big and valuable shifts that will upend some dominant market players, entrench others, and improve the ability of all companies to meet the demands of customers faster and more accurately. Let’s take a look at eight tech announcements that I believe will shape the future of customer experience. I’ve seen so much this year in the evolution of retail, and it is already starting to shake things up. It’s really exciting for both customers and retailers, but it can also be a bit intimidating if you don’t know what you’re looking at. By now, there are hardly any standalone players remaining in the retail market. Retail ecosystems are being build at high pace, and this is becoming the way to achieve the scale, attract talent and build the capacity needed to survive and thrive in today’s (and tomorrow’s) market. We saw this process begin in 2017 when Amazon purchased Whole Foods, but now it’s turbocharged. The Whole Foods acquisition has been a wake-up call for a lot of people who head up retail organizations. As a result, many US retailers have extended their partnership with Instacart, a front-end e-commerce solution for grocers. 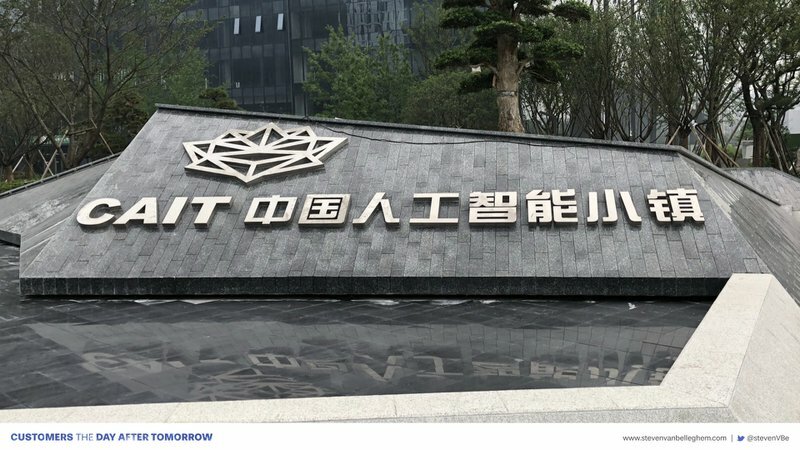 Walmart opened up a collaboration with JD.com, which was founded by the Chinese Tencent, as well as setting up a retail partnership with Google Home to compete against Amazon Alexa, and investing in Flipkart from India. This combination of channels and resources is creating stronger players, trying to get ready to deal with modern customer needs. Kroger found a Chinese partner in Alibaba to do the same. Amazon is partnering with Monoprix. Tencent has a share in Carrefour. Google has a e-commerce partnership with Carrefour. Over the course of just two years, the retail world has evolved from many standalone businesses trying to win against competitors into a complex ecosystem of partners, working together to win the business of customers. I feel the same evolution will happen in other industries – you can already see the same evolution in media and automative, and I am sure others will follow. Artificial Intelligence capabilities are moving quickly into the realms of influencing your day-to-day customer experience. In 2018, we started to see how prediction (AI-based) can become part of the toolkit of all companies. Predicting and understanding customer behavior helps to boost the quality of the customer relations. For instance, Uber is now able to tell if a passenger is already drunk – which is, of course, helping the Uber driver, rather than the customer. Google can predict what cities have relatively more obese and overweight people. And China’s Didi Chuxing can produce automated ratings for each of its passenger rides. Algorithms that predict our future purchases are creating a big part of Amazon’s business, and the fact that we are so hooked on Netflix is mainly based on their ability to predict our future behavior. When it comes to customer experience, these new prediction capabilities have a lot to offer. One example I particularly like comes from the Finnish elevator manufacturer Kone, and their pioneering work in the field of Predictive Maintenance. Thanks to sensors in the elevators they can begin to predict when an elevator will break down. This evolution has two consequences for customer experience. First, we will see the arrival of predictive commerce, as more and more companies will predict your future purchases, and customers will be hooked in faster than they think. The second consequence, as prediction becomes more and more mainstream, is that the human interpretation will increase in value. As human interpretation will become more and more scarce, its value will increase rapidly. #3 Shopping without a checkout is about to become the norm: Amazon, JD and more! Back in December 2016, I was really excited when Amazon became the first company to launch a store concept with no checkout. AmazonGo replicates a complete store experience, but without the inconvenience of having to line up to use the register at the end. This changes the game for the role of a retailer’s physical presence, how it can be used, and integrated into their broader strategy. Amazon has now announced that they plan to open 3,000 of these stores over the next three years, all across the US. And, not to be outdone, JD has announced it intends to open 1,000 of them per day in the next three years! And none of this even counts the startups operating under the radar that are getting ready to launch. I’m sure we’ll hear about them soon! 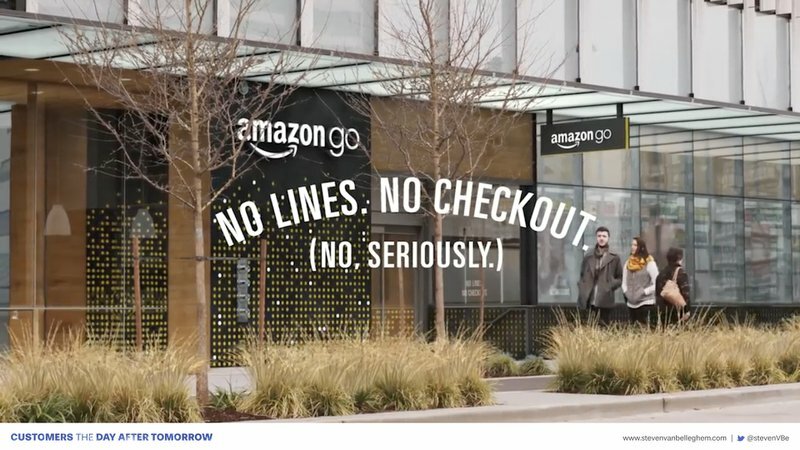 Just 2 years ago, the idea of a store without registers, cashiers or checkouts was a crazy concept inside Amazon, but it could soon be the new norm! The AmazonGo store seems to be very lucrative, as it has a very high revenue rate per square meter, but these concepts are unlikely to be copied and pasted exactly into big grocery stores, as the system currently only really works well for smaller stores where people buy 1 to 5 items. However, the expectations of fast checkouts in offline retail will increase rapidly, so there is a big chance that we will see innovative check outs pop up at larger retailers in line with this evolution. #4 Waymo has gone live with their fully-autonomous cars. This like is the Wright Brothers moment for autonomous transportation. We’re in the final part of the test stage for autonomous cars. We’re past the “what if?” stage, and into “what next?” Google’s autonomous car service, Waymo, has launched in Arizona this year with no more human safety driver. The AI has reached the stage where it was able to go fully live. It is not just Google who is moving at high pace in this field. Tesla still wants to play a leading role in the world of driverless cars. At the beginning of November they announced their new software update that allows drivers to ‘call’ for their car via a smartphone or watch, and then the car drives to the driver. This is getting very close to Knight Rider, my favorite TV show of the 80s. This is, of course, just a first step. We don’t have a world full of driverless cars, but the progress is more significant than ever. The impact of this evolution will be pretty widespread. It will not just change the mobility experience, but also the entertainment world. It will also create the need for the healthcare industry to start growing organs in an alternative way, as the amount of road traffic accidents will decrease (which is good), so too will the number of available donor organs. With maturing driverless technology, this new form of automation can be used for the delivery of parcels. This automation can create the necessary cost reduction to make parcel delivery even more convenient: one delivery with multiple parcels instead of multiple deliveries with a single parcel, and delivery can be straight to the present location of the customer. The Waymo technology may not be perfect yet, but it’s come a long way already, and we can start to see the outlines of what is next. Back in 2016, Google’s Deepmind stunned the world when it defeated the reigning human champion in Go, which is widely considered the most complex game for a computer to win. This win was noticed especially acutely in China, where the game originated. It was seen as a kind of national disgrace that a foreign technology had managed to win over one of China’s most treasured cultural achievements – a bit like if a Chinese team suddenly won the Superbowl in the US. This was a huge wake up call, and the Chinese investment in AI subsequently boosted like crazy. In 2018, I visited China to see their China AI Town. It was an amazing experience. The whole campus is more than 2 square kilometers, like a full-on sci-fi city, filled with companies and researchers and everything you can imagine, all focusing on AI. They created the plans for this campus in July 2016 (a few months after the Google and Go incident), and the campus opened in July 2017. The speed and the size of the investment is enormous, and this is just one example. The next few years will see a battle between the US and China to define who will become the leading country in the world of AI. It’s going to be an interesting race, as the US certainly aren’t backing down. In mid October, MIT and the famous financier, Stephen Schwartzmann, announced the launch of a new MIT campus focussing on educating AI talent. This new campus is backed by $1Bn in donations. The developments in AI will be seen in the field of image recognition, image creation, language understanding. All of these evolutions will lead to better understanding of customer data, it will lead to more convenient interfaces and will have a huge impact on how customer experience develops in the next decade. Over the past few years, we’ve all been spending time talking about how your behaviour while carrying your smartphone was monitered by big technology companies. But it’s now becoming clear that the car is going to become the new focus, around which this discussion is going to be taking place. General Motors has been making big advances in the fields of smart cars and autonomous driving recently, and has now talked about how it listens in to passengers and drivers while they’re using the car. They don’t listen to the actual converstions of people – they monitor how people listen to music and how they use the car’s entertainment system in general. They check out the kind of media you are interested in, and the the volume level you use. Their goal is to better understand their customers and find out what they want, and they will use this information to develop new services for the future. In a world of driverless cars, a car becomes a potentially lucrative entertainment and advertising platform. Companies that start on that learning curve today, will probably be faster at leveraging this new opportunity. Another discussion is of course around which AI assistant will be used in your car. Will you drive a Ford powered by Google. Or will you use Google software in a Ford ‘box’. This evolution started to develop significantly in 2018. Toyota integrated Amazon’s Alexa in their cars. Nissan, Renault, Volvo and other big brands announced partnerships with Google. Initially many car manufacturers said that they wouldn’t work together with tech players, because they didn’t want to share the data, and for that reason, Mercedes created their own AI assistant. The reality is that most car brands don’t have the specialist talent or the money to create their own AI interface, so there is no choice but to collaborate with one of the tech players. If not, they will lose ground. The car is now a computer on wheels – it is becoming a data platform, which will create new business models in the next few years. 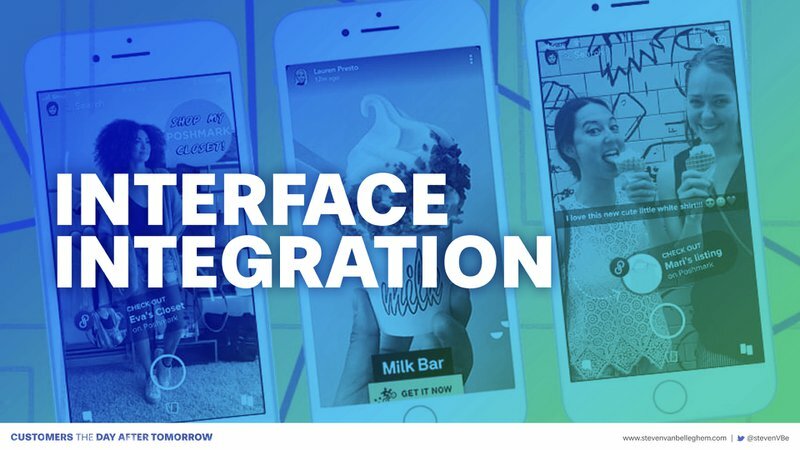 One trend we have seen more and more of over the course of 2018 is integrated interfaces – or apps that offer more and more in-app applications. In China, this is already the most normal thing in the world, as they use WeChat for multiple tasks every day, and this is perhaps the best example of an integrated interface. In the West, we are now starting to see similar evolutions. Snapchat now allows you to scan and identify products so you can instantly buy them on Amazon. The Amazon app has a camera scanner so you can get the price on Amazon for each and every item you encounter, right away. And of course, the possibilities don’t end with shopping apps. Banking apps could start to implement new functionalities to help you get a sense of where your expenses fall in your budget. Real Estate apps might be able to start giving you pricing through the image. There really is a lot of room to expand. At the start of the smartphone age, we used to have individual apps with individuated purposes. Hundreds of apps, potentially. But in the future, as I see it, we’re moving towards a world where interfaces and functions are getting more integrated. I think what we’re going to start seeing is much fewer tools, but much morepowerful tools. Cameras are only part of this evolving story from 2018. Once you also integrate voiceinto the mix, the real improvements to the customer experience start to take shape. #8 Bezos’ Famous Microwave: What’s up with that? Earlier this year, Amazon launched a microwave that integrated Alexa. The critics were harsh: “How dumb is this? !”, “What is Amazon launching a microwave for?” and so on. However, I think many of these critics are missing the point. Amazon isn’t launching a microwave to launch a microwave... they’re launching a microwave to demonstrate how powerful it is to incorporate Alexa in every home appliance. This is proof that 2018 has been the year that voicebroke through as the major tool on the mainstream market. Amazon is not just interested in selling smart speakers. They’re looking to make sure voice-activated devices are everywhere, and that it is their software that runs them. With an Alexa-powered microwave, you can create your own personalized commands, like “reheat my dinner” or “defrost 1 pound of beef.” But that is only the easy stuff – voice is going to be the primary interface in the coming years, and Amazon know it. We’re now reaching the end of 2018, and it has been fascinating to watch the huge progress that been made in Artificial Intelligence and the tech world generally, and what these improvements mean for the overall Customer Experience. Of course speed and impact of tech developments only increases with time, so it is going to be phenomenally exciting to see how these trends continue and intensify in 2019.